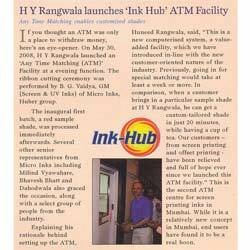 Established in the year 1972, we, Huned Y. Rangwala, are an eminent manufacturer, supplier and exporter of Inks and Chemicals for Screen Printing & Offset Printing. Apart from this, we are also engaged in trading a broad array of Link Inks which manufactures speciality inks. We have earned good reputation and credibility in the industry by providing quality-tested products and services to our patrons. we also provide technical guidence for screen printing service to our valuable patrons. Our offered range of products include Printing Ink, Dry Offset Ink, Emulsions Coatings. Further, our infrastructure is equipped with latest machinery and equipment, which helps in cutting down the production cost and provide our product range at affordable prices to the clients. Based at Mumbai, (Maharashtra, India), ours is a Sole Proprietorship (Individual) firm. Initially, we started as a small supplier of Screen Printing Inks and Accessories but over the years, we have positioned ourselves among the most reliable organizations across the nation. Apart from this, we also offer our clients with the updating and automation of the screen-printing process. With us we have a spacious warehousing unit which helps store all our products safely in an organized manner. All these factors have helped us in creating a wide client-base at every territory of India and the neighboring countries like Nepal and Bangladesh & East Africa. Owing to our continuous automation and updated screen printing facilities, clients can avail from us specialized inks such as light reactive colors, PCB's, textiles, thermo-chromic, UV, Dry Offset, Flame Free inks, Two pack inks, Eva inks, Balloon inks, Glow in Dark inks, Peelable Silver, reflective inks & imported gold paste.inks for foils, artist material, spray guns and others. We also offer our clients with the customization facility of the products, so that they can avail our product range as per their exact expectations. Under the guidance of our mentor, Mr. Huzefa Rangwala, we have achieved the desired success within the short span of time. His in-depth knowledge, excellent managerial skills and continuous motivation have enabled us to stay ahead over our industrial competitors. We are exporting mainly to Africa and Gulf Countries. Trading of Inks and Chemicals for Screen Printing. Owing to the finest and quality-tested products provided to the customers, our organization has achieved pre-set goals and objectives. We believe in providing our products as per set industrial standards and norms. Our product range is approved and highly demanded by the clients for its unmatched quality and timely delivery. Screen Print India Exhibition (1988). Award for best stall display 3rd runner up. Screen Print India Exhibition (1944). Award for best stall 1st runner up. Screen Print India, Excellent Supplier & Dealer Award 2001 (Golden Rating) Mumbai Zone. We have employed a team of diligent professionals, who assist us in handling all our business operations. They stay in close contact with the clients and understand their exact requirements and demands, supporting us in offering suitable product range. These experienced professionals excel in their field of specialization and work as per their assigned job. They are responsible for the quality checking each product at all stages of production. Furthermore, regular training is provided to the clients in order to keep them at par with latest industry changes and developments. We are engaged in rendering Technical Support for all our offerings. Clients can avail technical support from us for Screen Printing Supplies and Chemical Composition. With our extreme dedication, we are capable of bringing the finest products to the clients' disposal. Clients are provided with a leverage to detail their demands and in turn we offer them with the same and that too within the promised time frame. Our firm has emerged as a renowned manufacturer and supplier of Inks and Chemicals for Screen Making and trader of Link Inks. Client oriented approach, quality-tested products, affordable prices and timely delivery are some of the factors that allow us to lead in the industry. Our transparent dealings and ethical philosophy enable us to earn credibility in the market.